Pictured (l-r) are Curb College of Entertainment and Music Business Dean Doug Howard, Universal Music Publishing Group Nashville Executive Vice President/General Manager Kent Earls, Atlantic Records recording artist Hunter Hayes, Cyndi Forman, Patrick Joseph Music President Pat Higdon, ASCAP Senior Director of Strategic Services Kele Currier and Curb College Instructor of Music Business Dan Keen. Belmont University’s Mike Curb College of Entertainment and Music Business, alongside industry partner ASCAP, recently honored alumna Cyndi Forman as the latest recipient of the Music City Milestone Award (MCMA). Forman currently serves as the vice president for creative for Universal Music Publishing Group Nashville. 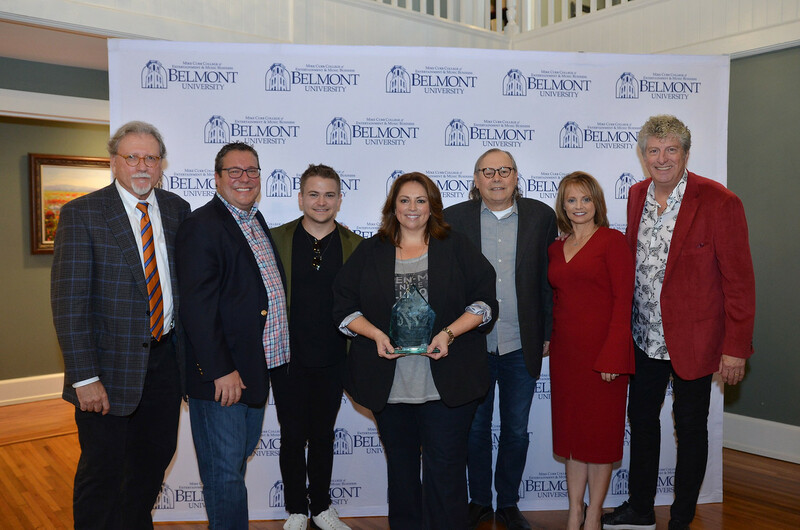 The MCMA celebrates Belmont’s connection with Music Row while recognizing a Belmont graduate who has achieved truly superlative success in the entertainment and music industries early in their career. In addition to attendance from publishing executives and friends, Atlantic Records recording artist Hunter Hayes surprised Forman at the event in her honor–Forman is credited with signing and developing Hayes. After obtaining her Music Business degree from Belmont, Forman became creative director at Balmur Entertainment. During her time at Balmur, she landed many cuts and was quickly recognized as a great “song person.” In 2002, she joined Almo Irving Music which became part of Universal Music Publishing Group in 2003 where she assumed the role of creative director. After continued success, Forman was promoted to senior creative director and has been credited for securing many significant cuts. Along with Hunter Hayes, she currently works with great names such as Ryan Hurd, Sam Ellis and duo Striking Matches. Her current role focuses on furthering artist and writer development, leading the creative staff and finding key opportunities for UMPG writers and the UMPG Nashville catalog of songs. In 2013, she was recognized as one of Music Row’s Rising Women on The Row by Music Row Magazine. The Nashville Business Journal also recently recognized Forman at their annual Women in Music City Awards. Previous Music City Milestone Award recipients include Beka Tischker, Ben Vaughn, Ashley Gorley, Connie Harrington, Rusty Gaston, LeAnn Phelan and Carla Wallace.